ne of the perks of living in Central Oregon is being surrounded by people who live an active life, whether it's through skiing, running, climbing, cycling or a myriad of other sports. But the upside of this can also work against you. Being surrounded by other athletic people can be intimidating. 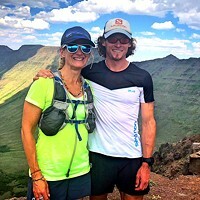 When you're huffing and puffing your way through a 2-mile jog, you just might get passed by a professional athlete such as Max King or Renee Metivier. This feeling isn't limited to adults. Remember gym glass and hoping and praying that you wouldn't be the last kid picked for the team sports? This is where Girls On The Run comes in. There are programs all over the country, and Central Oregon's council has been operating in Bend for almost 10 years, at several schools. Despite having "run" in the name, the program is about more than that. "It's less about running and more about setting a long-term goal. In this case completing a 5K," explained Emily Usselman, Girls on the Run council director. "It has a body-positive aspect to it, which means no talk about exercising to lose weight. Instead, the focus is on exercising to feel better, mentally and physically. Right now, GOTR is hosting volunteer-led programs at Amity Creek Elementary, Silver Rail Elementary, Miller Elementary and the Boys and Girls Club. GOTR also hosts a middle school program called Heart & Sole at Bend International School, which allows the girls more independence. Girls On The Run is an inclusive program, Usselman emphasized, for girls of all athletic abilities, from the girl who's been playing sports competitively since she started walking to the girl who typically shies away from physical activities. "The best part of this program is watching the girls cross the finish line and do something they didn't think they could do," Usselman said. "You don't realize how much they need this program at this age, but when the program starts you can see how low they are, and by the end they are power charged!" Program coordinators understand that many girls don't have positive, supportive adult figures in their lives, which can leave them floundering. "I have always been into sports, and I always had a person there encouraging me to do my best," Usselman said. "I can't imagine what it would be like to be a third grade girl and having no confidence in being active, or even just going to school. No girl, especially girls that young, should feel like that." After the 10-week session, the program culminates with the girls running or walking a 5K race. This year the race will be the I Like Pie race over the Thanksgiving holiday. Another benefit to this program is that the registration fee is on a sliding scale based on parents' income. "Each girl has a star shining bright inside them, and some days that star gets covered by clouds," Usselman explained, using some GOTR terminology. "When a girl comes to Girls On The Run, she has a team of girls and coaches to help clear away the clouds."